Based on field research in the autumn and winter of 2015, BICC researcher Heidrun Bohnet analysed the patterns of return and coping strategies of returnees, as well as assistance that aid agencies are able to provide. The results of this study are documented in BICC Working Paper 7\2016. South Sudan is torn by constant violence, and the return of displaced peoples is far from being realized. Nevertheless one can learn from past experiences of those who have already returned. The findings of No linkhandler TypoScript configuration found for key tx_bicctools_publications.. “Back to turmoil: Refugee and IDP return to and within South Sudan” indicate that return is neither a simple, linear nor necessarily durable solution. From the viewpoint of the returnees, the main challenges of return are the lack of physical security, food, water, education and jobs. 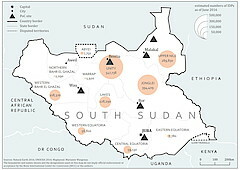 As resources in South Sudan are very scarce overall because of a collapsing economy and continued fighting, competition over resources between returnees and local communities, as well among returnees, is common. The easy access to small arms, ethnic divisions and mistrust between groups further exacerbate these tensions. The sustainability of return seems to depend largely on how well returnees can access resources at their return location and thus secure a livelihood for them and their families, which, in turn, is not only influenced by the social network and political access the returnees have but also the economic situation at the return location. Aid agencies therefore should support livelihood opportunities and early development programmes at the preferred return locations, including local communities and youth groups, in their efforts to reduce feelings of inequality between groups. Besides diversified and long-term economic development initiatives, higher education opportunities as well as psychological support must also be provided to guarantee self-sufficiency of returnees and prevent renewed displacement. Press release "Neue Publikation \ Back to turmoil: Refugee and IDP return to and within South Sudan"